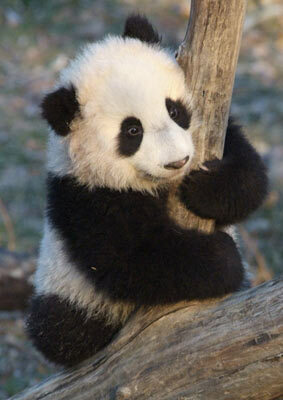 This little panda, this little boy named Tai Shan, is simply the cutest creature on the planet. He’s even cuter than Annabelle (she can’t read, so she won’t know I said this). I’ve mentioned him before, but this is a more recent photo. Real-time video plays on my office computer all day long, so I am treated to his antics — and even his naps — while I am waiting for orders to go through or reports to process or other bookstore stuff to happen. I’ve put the link to the National Zoo website on the sidebar so that you, too might stop by and enjoy the boy. Now back to the knitting (no pictures, though). I might — just might — have turned a corner on the Jaywalker thing. Either that, or I’ve gone round the bend. I think the one I’m making now will work, so I’m going to dedicate thirty minutes out of every knitting hour to finishing the pair. Don’t anybody hold me to that, but maybe if I make this public declaration, my fear of failure will overcome my desire to knit something — anything — else. Cara needs to give me one of those head-butting smileys, though. I deserve one. My little scarf diversion looks about like it did the other day, only much longer. It’s a soft, pretty little thing, and just what I envisioned. When it’s off the needles and has been washed and blocked, I’ll take another picture. I do like the yarn, and I think it would be beautiful knit up into something larger. Today, which is my day off, I am going to pull out all the Wildflower Manos, wind it into balls, and get it ready to become an Olympic Sweater. That will be enough training for one day, I think. One has to be careful to build one’s stamina over time, dontcha know. That, along with carbo-loading, is a given. Margene posted about another interesting creative join-along thing, and once I read about it I signed right up. It’s Lolly’s Project Spectrum. I love the idea, and I can’t wait to begin planning color-themed projects — knitted, spun, painted, or whatever. It is a wonderful thing to be conscious of all the ways we are creative in our daily lives, and of all the little detours we can take on our path that will bring us creative joy and satisfaction. J gave me a poster once (hi, J! ), with a quote from Proust: “The real voyage of discovery consists not in seeking new landscapes but in having new eyes.” I think I have been coming to that conclusion for a while now. It’s funny, but when she gave me that poster all those years ago, I think I was on a similar journey. Different Jane, perhaps. Now, let me go and try to see those Jaywalkers with some new eyes. Maybe that will help. I’m telling Annabelle! (okay, I won’t)I forgot, but I’ll add on my blog – the new wheel is made by Mecchia, she’s about 20 – 25 years old. They no longer make wheels, just looms. It’s a rare NZ wood, Kauri, and is just breathtaking…. Double drive, which I’m not used to, and since I had to put her together from scratch I’m not sure I’ve got it set up properly, but I’ll get her going this weekend for sure… oooohhh… did I mention how gorgeous she is? J, it was before I moved up here, before I even made the plan, when you were the only person who knew I wanted to.I don’t know why I am posting in my own comments, when I’m pretty sure I’ll be talking to you before the day gets too old! Oh, whatever. Did you work on your socks? sorry I tagged you… didn’t know who else to do – or even how to do it– blame Trish she got me first.